Why take the Inpatient Obstetric Nursing exam? In order to receive the National Certification Corporation (NCC) Inpatient Obstetric Nursing credential (RNC-OB), candidates must take and receive adequate passing scores on the Inpatient Obstetric Nursing credential examination. If you are a Registered Nurse (RN) who specializes in Inpatient Obstetric Nursing, then earning the RNC-OB credential is the best professional path for you. The RNC-OB credential will demonstrate to your employers and peers that you understand, incorporate, and implement the knowledge and skills necessary to be exemplary in the field of Inpatient Obstetric Nursing. The NCC offers the RNC-OB credential so nurses like you are able to demonstrate their knowledge publicly and be recognized for the knowledge and skills they possess. In short, the Inpatient Obstetric Nursing exam will lead you to the pinnacle of credentials in your chosen specialty and demonstrate dedication to your profession. Prepare with our Inpatient Obstetric Exam Study Guide and Practice Questions. Print or eBook. Guaranteed to raise your score. Get started today! To apply to take the Inpatient Obstetric Nursing exam for the RNC-OB credential, you must hold current Registered Nurse (RN) licensure in a territory or state of the United States or Canada. Additionally, you must have 24 months in the Inpatient Obstetric Nursing specialty, which must be comprised of 2,000 hours minimum of education, direct patient care, research, or administration in the specialty. Your employment in the specialty of Inpatient Obstetric Nursing must have occurred within the past 24 months, and both the hours mentioned above and the employment requirement must be met before you can apply to take the exam and earn your RNC-OB credential. Inpatient Obstetric Exam Flashcards. Proven flashcards raise test scores on the Inpatient Obstetric exam. Guaranteed. For an individual, the Inpatient Obstetric Nursing credential exam must be taken electronically, as the individual paper option has been discontinued. You can apply to take the electronically administered Inpatient Obstetric Nursing credential exam on the NCC website. The Inpatient Obstetric Nursing credential exam is 3 hours in length and there are no breaks. So, be prepared to sit and take the exam during the 3-hour timeframe. In terms of structure and content, the exam is organized into 7 different sections with 175 total questions. Each section addresses specific topics and is weighted differently. Pay attention to the weights for each section, but do not be fooled! The first section is comprised of questions related to maternal factors that affect the fetus and newborn child. This section is weighted at 14% and will address the topics of disease processes and pregnancy risks. The next section is designed to determine your assessment of the fetal condition. This section is weighted at 20% and consists of questions related to antepartum assessment, electronic and non-electronic monitoring of the fetus, and assessment of acid-base statuses. The next section of the exam is focused on the labor and delivery process and is weighted at 29%. This section will contain questions related to labor physiology; stages, assessment, and management of labor; obstetric procedures; and pain management in the labor and delivery process. The fourth section of the exam addresses obstetric complications, including placental and labor disorders, labor in preterm, multiple gestations, and pregnancies that have been prolonged. This section is weighted at 20%. The fifth section of the exam assesses your knowledge of postpartum situations, including the physiology of the postpartum woman, adaptation of the family, lactation, and postpartum complications. This section is weighted at 10%. The next section is designed to assess your knowledge of the newborn. This section is weighted at 5% and covers questions related to newborn adaptation to life outside the uterus, resuscitation, pathophysiology, and infant nutritional needs. The final section of the exam is weighted at 2% and covers professional issues related to evidence-based practice, legal and ethical concerns, communication issues, patient safety, and research in the field. What is the Inpatient Obstetric Nurse certification? The Inpatient Obstetric Nurse certification exam is a test used to evaluate an applicant’s knowledge and practice in obstetrics. How much does it cost to take the Inpatient Obstetric Nurse exam? There is a non-refundable application fee of $50 and a testing fee of $275. How do you become Inpatient Obstetric Nurse certified? To become certified as an Inpatient Obstetric nurse, you must have a current RN license, 2 years of RN experience, employment sometime in the last year, and pass the Inpatient Obstetric Nurse certification exam. Is the Inpatient Obstetric Nurse exam all multiple choice? Yes, there are 175 multiple-choice questions on the Inpatient Obstetric Nurse exam, including 25 unscored questions. How long do you have to take the Inpatient Obstetric Nurse? Test-takers are given 3 hours to complete the exam. How do you sign up for the Inpatient Obstetric Nurse exam? To sign up for the Inpatient Obstetric Nurse exam, visit the National Certification Corporation website. There is no set percentage passing level, according to the NCC. There is no penalty for wrong answers; your score is based on how many answers were answered correctly. Possessing a firm understanding of the content and structure of the Inpatient Obstetric Nursing credential exam is the first step toward earning your RNC-OB credential. Getting adequate rest before the exam and taking care of yourself physically will also help you feel prepared and ready for success on exam day. However, the best method of ensuring you do well on the Inpatient Obstetric Nursing exam is to prepare using the best preparation materials you can find. Sure, you can search the internet and find bits and pieces of the exam on several websites. But, what if you could find everything you need in one place? In addition to the basic exam materials you can find on the NCC website, Mometrix Test Preparation offers a comprehensive Inpatient Obstetric Nursing exam guide: Inpatient Obstetric Nurse Exam Secrets. This guide is unlike the others in that you get actual Inpatient Obstetric Nursing exam questions that help you reach the high scores you are capable of reaching. 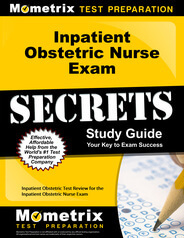 The Inpatient Obstetric Nurse Exam Secrets guide was written by exam experts who understand how to successfully pass the Inpatient Obstetric Nursing exam and earn your RNC-OB credential. 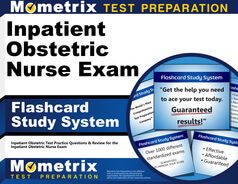 Mometrix Test Preparation’s standardized test researchers have discovered the secrets of the Inpatient Obstetric Nursing exam and are able to impart to you exactly how to reduce your stress, beat the exam, and demonstrate to the world your dedication to Inpatient Obstetric Nursing by earning your RNC-OB credential. In addition to the Inpatient Obstetric Nurse Exam Secrets study guide, Mometrix also provides test-takers like you the Inpatient Obstetric Nurse Exam Flashcards and a comprehensive Inpatient Obstetric Nurse Practice Test online. Earn the best scores you can earn on the Inpatient Obstetric Nursing credential exam by adequately preparing, rigorously studying, and testing yourself with actual Inpatient Obstetric Nursing exam content. Read the Inpatient Obstetric Nurse Exam Secrets study guide, test your knowledge with the Inpatient Obstetric Nurse Exam Flashcards and Practice Test, and earn the RNC-OB credential you deserve as a leader in the specialty field of Inpatient Obstetric Nursing.